“And seek help in patience and As-Salah and truly it is extremely heavy and hard except for humbly submissive [to Allah]”[Quran chapter 2, Verse 45]. Patience comes first in the sequence of this ayah. Patience is not an easy behavior to gain. The Almighty has granted us several examples of patience shown by the Prophets during hard times, in the Sunnah and the Qur’an. He has also detailed for our perusal their dua’s which received a favorable answer. One of the most powerful of these narrations told to us by Allah is the one of Ayyub . There are many gems of wisdom in this story for a productive Muslim. “…Truly! We found him patient. How excellent a slave! Verily, he was ever oft-returning in repentance to Us”[38:44]. I praise You, the Lord of lords, Who bestowed His kindness upon me and gave me wealth and children, and there was no corner of my heart that was not filled with attachment to these worldly things, then You took all of that away from me and You emptied my heart, and there is nothing to stand between me and You. If my enemy Iblis knew of this, he would be jealous of me. “And (remember) Ayyub, when he cried to his Lord: “Verily, distress has seized me, and You are the Most Merciful of all those who show mercy”[21:83]. We made him an example lest those who are beset by trials think that We do that to them because We do not care for them, so that they may take him as an example of patience in accepting the decrees of Allah and bearing the trials with which He tests His servants as He wills.’ And Allah has the utmost wisdom with regard to that. Step 1 – Say Alhamdulillah first. 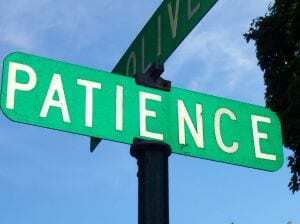 “The real patience is at the first stroke of a calamity”[Bukhari]. Step 2 – Engage ourselves in repentance in an extensive way. Step 3 – Trust Allah whatever befalls us and think well of Him. During the dark times of Ayyub’s tribulations he kept thinking well of Allah. “Verily, distress has seized me, and You are the Most Merciful of all those who show mercy.”[21:83]. We should make dua to Allah alone, using duas from the Quran and Sunnah. Step 5 – Be patient; we shouldn’t be hasty in obtaining an answer from Allah . And remember, Allah, most merciful loves us and everything that befalls us is for the best. Step 6 – Stay away from sins. Step 7 – Be proactive by being thankful in times of ease. “…And whosoever has Taqwa of Allah, He will make a way for him to get out (from every difficulty). And He will provide him from (sources) he never could imagine. And whosoever puts his trust in Allah, then He will suffice him. Verily, Allah will accomplish his purpose. Indeed Allah has set a measure for all things”[65:2-3]. Eva Mayi is a 27 year old Cameroonian Muslim woman living in France and has reverted some 4 years ago. She enjoys listening to Nouman Ali Khan speeches.